The Cardinals best pitcher to date, Kyle Lohse, was called upon to hold the Cubs down while his own team's offense tried to wake up. The Cubs sent a lefhander to the hill, Ted Lilly, to make sure the Cardinals' offense remained sleepy. Much like last night's game, but with a lot less hype, both pitcher's commenced to duel. The Cubs struck with the long ball, Mark DeRosa reaching a full-count breaking ball low and away, getting enough barrel to loft it into the right-center field bleachers for a 1-0 lead. Two innings later, in the fifth, DeRosa hammered Lohse again, this time a triple. DeRosa then scored the Cubs second run off of Ryan Theriot's RBI-basehit. Lilly continued to cruise, offering tons of off-speed and spotting everything in the known weak areas of each Cardinals' hitter. 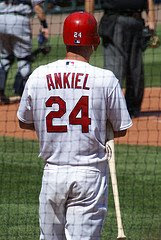 Rick Ankiel broke the ice of the Cardinals, driving a Lilly fastball (one of the few he'd thrown) that zone into Ankiel's wheelhouse. The homer was Ankiel's 17th, tying him for the club lead with Albert Pujols, who followed up the homer with a long fly ball that got to the left-center field wall before either DeRosa or Jim Edmonds could catch up. With Pujols in scoring position on second base, Lilly then struck out Troy Glaus for the third time. Pujols caught Lilly sleeping as Ryan Ludwick fell behind in the count, stealing third base when the Cubs' pitcher seemed to forget all about him leading off second base. Ludwick pulled a two-strike pitch down the third base line for a double, Pujols making sure Aramis Ramirez didn't glove the ball shooting past before he took off for home. Cardinals' manager Tony La Russa countered with reliever Ryan Franklin, who had been closing games during the last several weeks when Jason Isringhausen had difficulties with the rigors of the job. Derrek Lee jumped Franklin, doubling to deep left field. Ramirez then cranked one out to left, and just like that, the Cubs had their two-run lead back. The lead would have been three, save for a semi-rainbow out of right field by Ludwick to an awaiting Molina a home plate. With no sign of fearing an oncoming base runner, Moline blocked off a sliding Edmonds, slapping a tag on his helmet as he slid past. Cubs' manager Lou Piniella called upon his closer, Kerry Wood, to shut down the Cardinals in the bottom of the ninth. The Cardinals did something they've had a tremendously hard time doing so far in the series; they got their leadoff man of an inning on base. In this case, it came in form of Ryan Ludwick. Molina wasn't in any hurry to help Wood, who was having a bit of trouble finding the zone with his mid-90s fastballs. Molina drew a walk, becoming the potential tying run. Representing the potential winning run, Adam Kennedy might've fooled everyone in the park when he took a cut at the first Wood offering, a unlikely move considering Wood had just walked two batters. Kennedy's drive shot past Lee at first base, who earlier had made two sliding catches. Ludwick scrambled in easily from second base, but third base coach Jose Oquendo wisely held up Molina at third base. Piniella had pinch-hitter Chris Duncan intentionally walked to load the bases. Skip Schumaker hit a grounder to Ramirez at third, who fired home to force out Molina. The pivot and throw to first base was nowhere near quick enough to double up the fleet Schumaker. There was only one out, with the bases yet loaded, but this left the Cubs with a chance for a double play to end the game. Pinch-hitter Aaron Miles popped out to Theriot, and the Cards were down to their last out. Ankiel found a hittable pitch, up and bit away, and instead of trying to pull hard, his usual swing, he drove the ball more toward the middle, accomplished a walk-off single when Kennedy and Duncan scored the tying and winning runs, respectively. Kyle McClellan picked up the victory, improving his record to 1-3. The thrilling 5-4 victory for the Busch Stadium crowd and Cardinal Nation evened the series and proved the Cardinals could compete with the NL Central's and leagues best team.